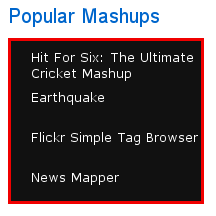 Google Mashup Editor and with it also News Mapper have been shut down. Read here for more information. News Mapper is a project created with the Google Mashup Editor. The goal of the project is to deliver daily news in a different way to the users. My aim was to display them on a Google Map depending on the location where they happen. The idea of such a project already appeared during the Internet Technologies course at the University during which I implemented it with some University collegues. The outcome was however not that satisfying (at least for me). The project at that time was based on a ASP.NET application hosted on an IIS server and a local C#.NET daemon for collecting all the news from different feeds and computing their location-info. Having a server on place is for sure more convenient since one can store also historical information in a local DB.